Everyone needs to carry their keys on them… so why not do it in style. The middle part spins around with a picture of your dog on both sides. Keep your hands busy without losing your keys. Announcing the hottest new key chain style out; German Shepherd Spinning Pet Key Chains! This is the perfect way to not only keep your keys in order but to show off your adorable pet as well. Each key chain is made of a heavy quality metal material to ensure durability and strength. The German Shepherds face is featured in the center of the oval shaped design, and the center can easily spin around. The outline of the key chain has the breed name written on the bottom and has cute little paws and dog bones around the edges. Each one measures 4 inches long, including the chain, and 1.5 inches wide. 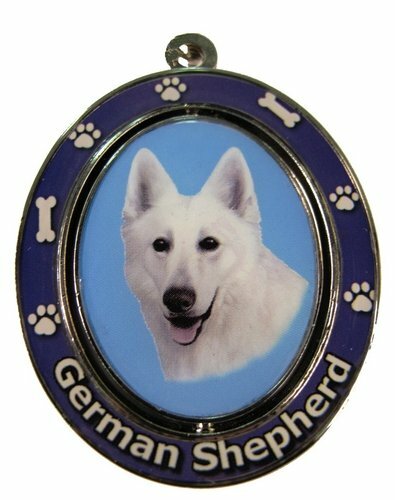 These key chains are unique and trendy making them a perfect gift for German Shepherd lovers and owners for any occasion.